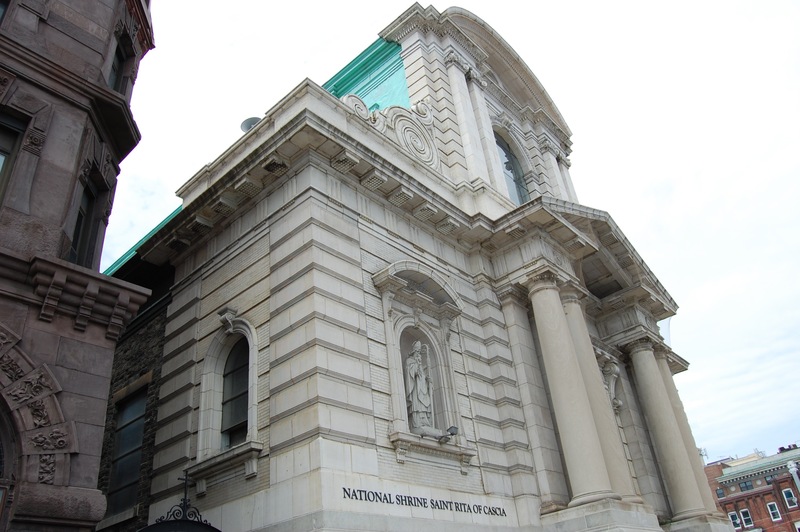 The National Shrine of St. Rita of Cascia in Philadelphia, Pennsylvania. May 22 is the feast day of St. Rita. Like Elizabeth Ann Seton, Rita of Cascia was a wife, mother, widow and member of a religious community, in her case the Augustinians. 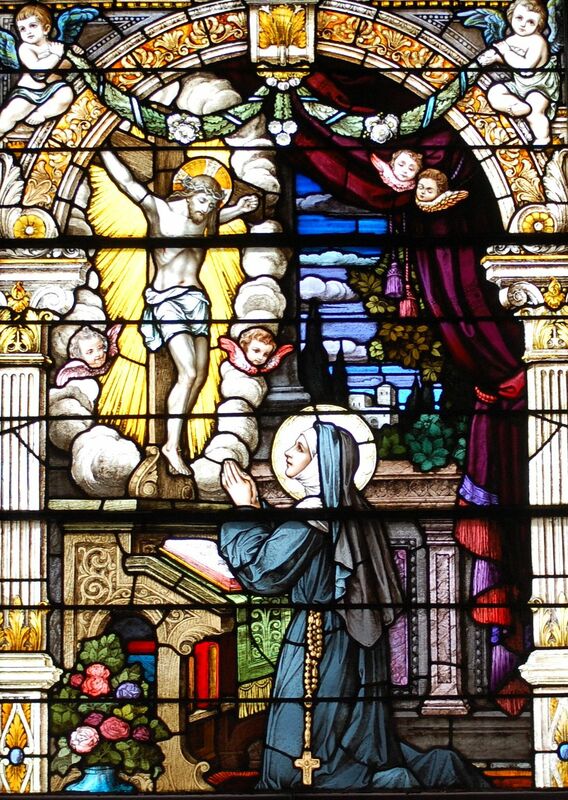 Each year, a Solemn Novena from May 13 to May 21 precedes the feast day. St. Augustine on watch at St. Rita’s Shrine. 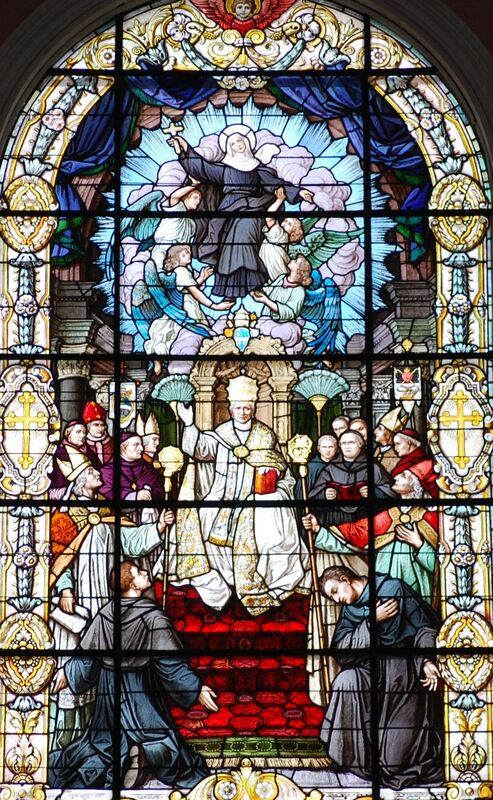 St. Augustine is the founder of the order to which St. Rita belonged. The shrine complex (Upper Church and Lower Crypt) is managed and cared for by the Augustinians. St. Patrick on watch at St. Rita’s Shrine. Irish Americans in the South Philly area were the first benefactors of St. Rita, just before the immigration of Italian Americans. 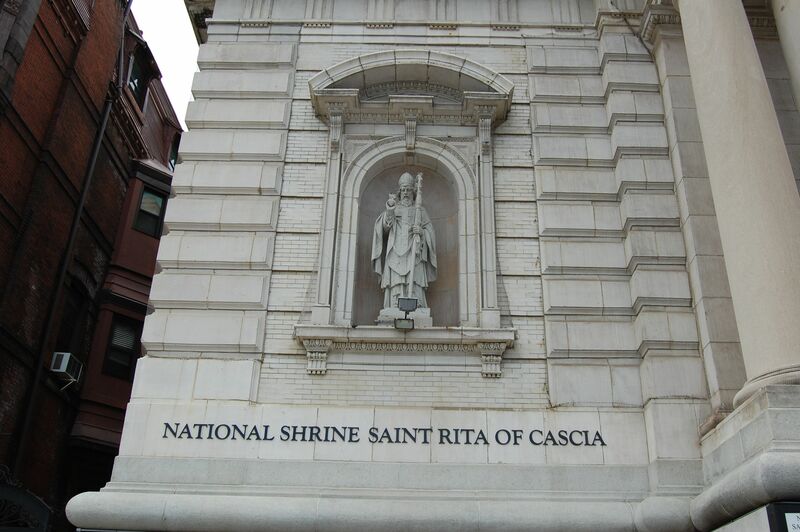 National Shrine of St. Rita of Cascia is in Philadelphia, PA. The Augustinians friars wanted a parish with Rita as patroness and therefore had the church built in 1907. St. Rita had been canonized a few years earlier in 1900. The main Upper Church of the National Shrine of St. Rita of Cascia, Philadelphia Pennsylvania. The left side of the nave are Augustine themed stained glass windows. On the right side of the nave are St. Rita of Cascia themed stained glass windows. 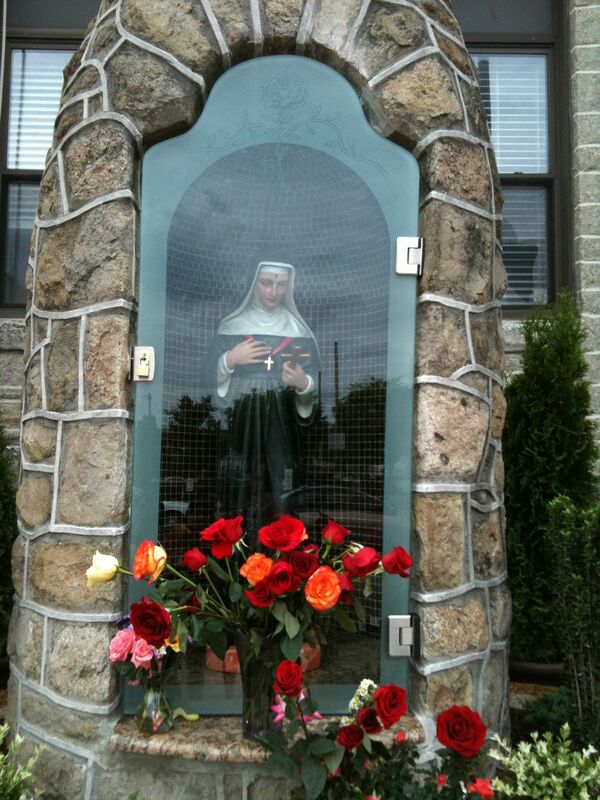 St. Rita supported by patron saints window. 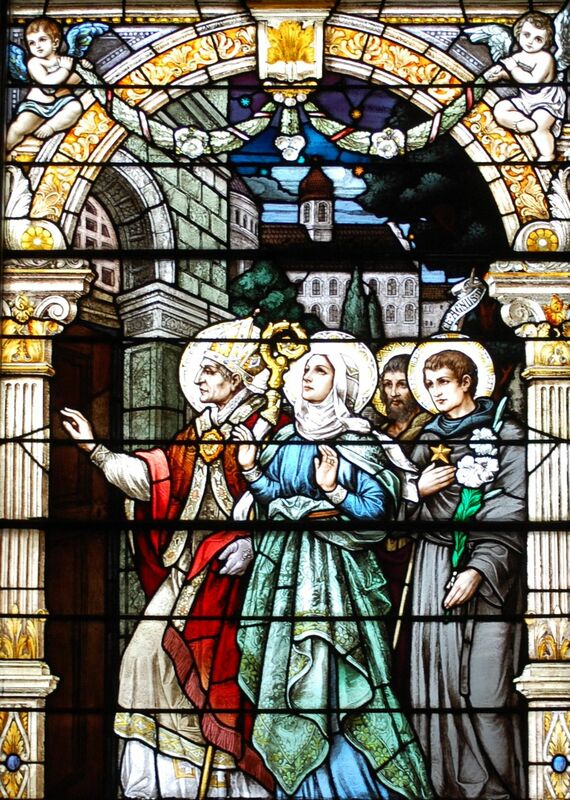 St. Rita approaching the entrance of the Augustinian Convent with her three powerful patrons; St. John the Baptist, St. Augustine of Hippo and St. Nicholas of Tolentine. The family strife within the community from the murder of her husband prevented her from enrolling in the convent. Upon brokering a deal with the warring families, she was later accepted into the convent. Rita is known today as The Peacemaker. Rays of Light Window. 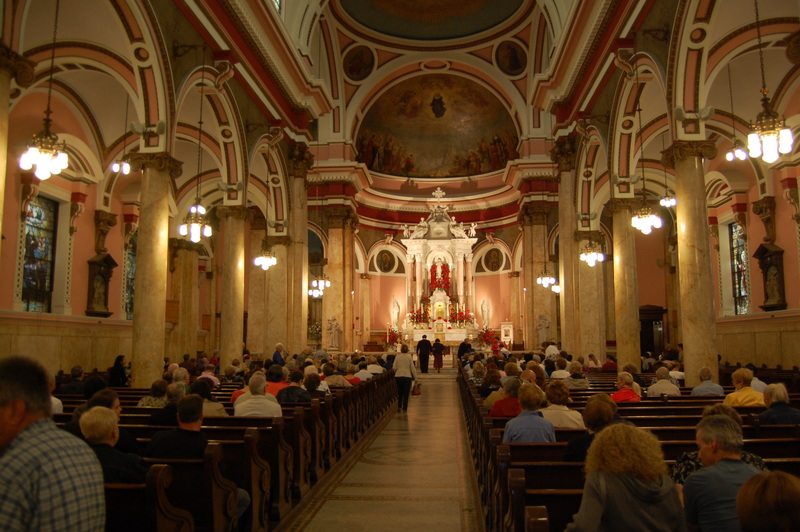 National Shrine of St. Rita of Cascia in Philadelphia, PA. 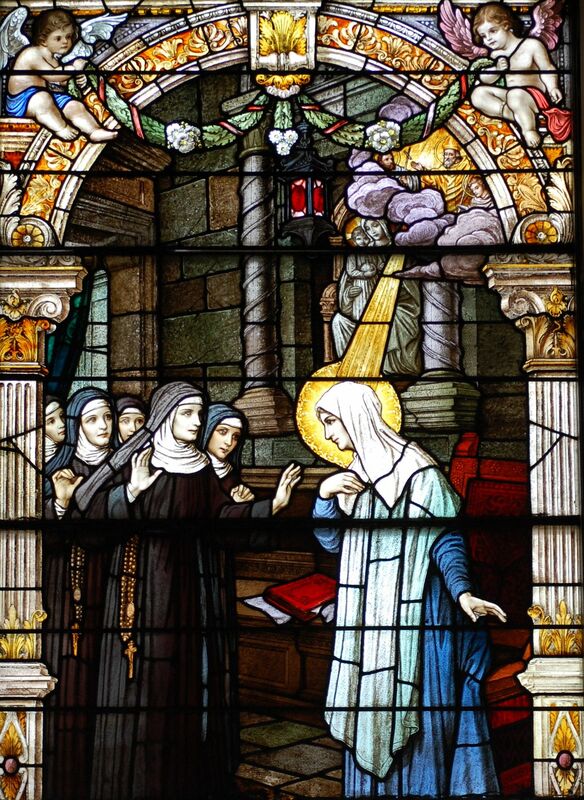 The rays of light from the power of prayer allowed Rita, through the intercession of her patron saints, to gain entrance to the convent building through locked doors and guarded nuns. In midwinter, a bedridden and ill Rita asked her cousin to bring her a rose from her family’s garden. The cousin thought the request absurd due to the winter conditions. Rita responded with her now famous saying, “My dear cousin, there is nothing impossible to God.” The cousin went to the garden to find a single rose in full bloom on an otherwise barren rose bush. The rose circulated among the nuns of St. Rita’s Augustinian order. 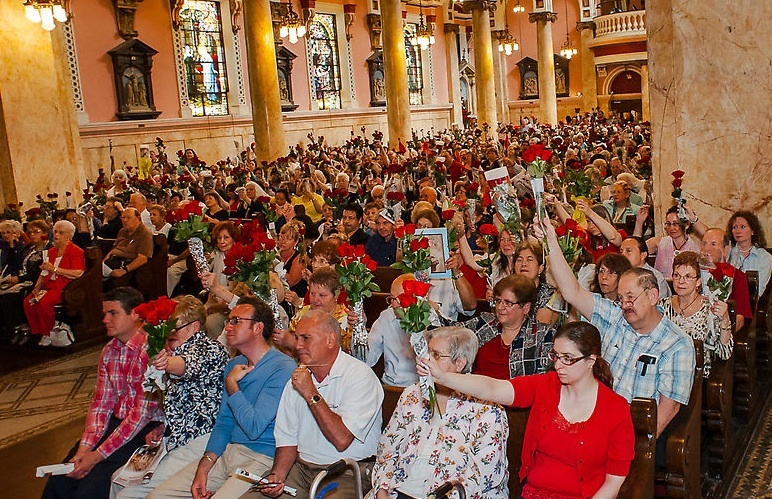 Today, roses are blessed each year in all churches of the Augustinian Order on the feast of St. Rita. 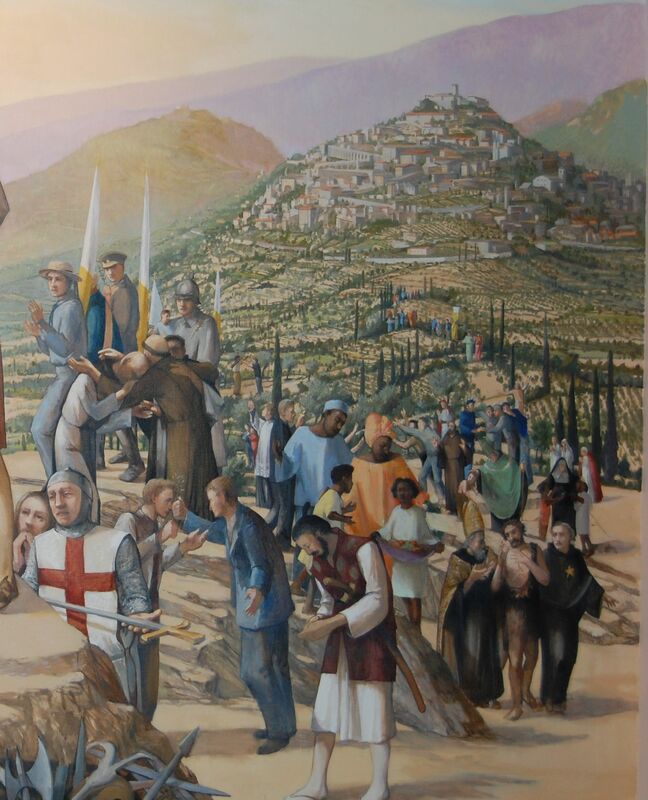 The Work of Peace mural in the Lower Crypt. 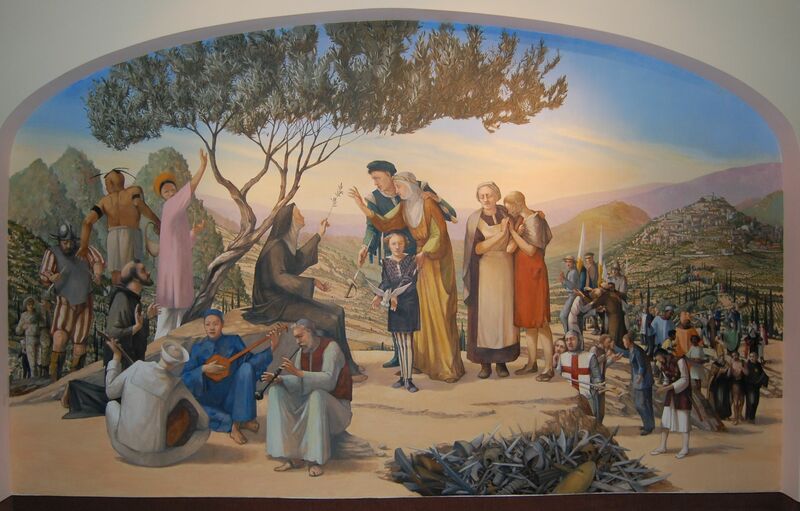 The mural shows St. Rita sitting under an oak tree extending an olive branch, a symbol of peace, to those drawn to her presence. To her left is Blessed Simon of Cascia, an Augustinian friar whose spiritual teachings influenced Rita. On a personal note, the boy releasing the dove, according to iconographer Anthony Visco, is Leonardo da Vinci of Sistine Chapel fame, whom he admires. Detail One in the The Work of Peace mural. Lower level of National Shrine of St. Rita of Cascia. Saints Intercession. Detail Two in the The Work of Peace mural. 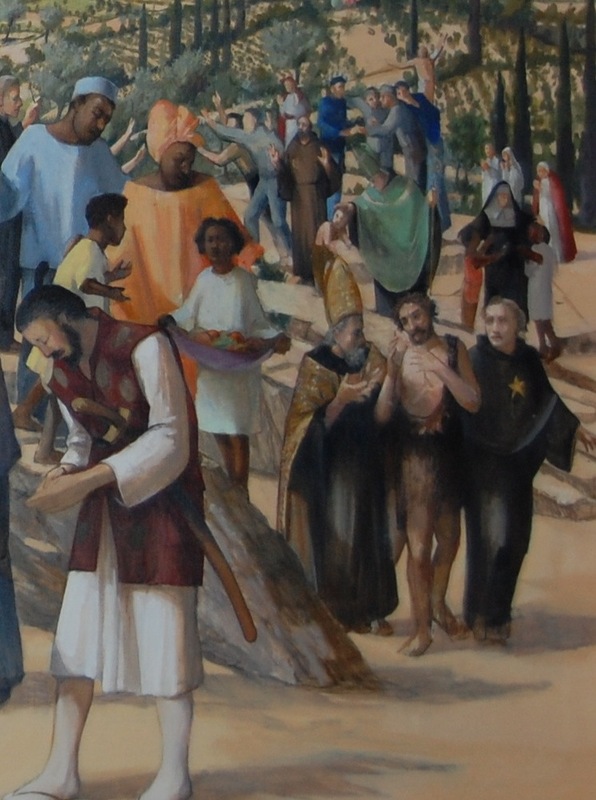 Looking closely at the lower right hand corner of the mural are St. Rita’s three patron saints, joined arm in arm; Augustine, John the Baptist, and Nicholas of Tolentino. Behind them are Mother Katharine Drexel and John Neumann, both Philadelphia Saints with their own shrines nearby: St. Katharine Drexel Mission Center and Shrine and The National Shrine of St. John Neumann. To the right, is recently canonized Saint John XXIII and to his left, Francis of Assisi. Since saints are in heaven close to God, we pray with the saints to God and ask the saints to intercede and navigate the spiritual universe on our behalf. We also ask the saints to pray for us. Certain saints have a particular specialty. For Rita, it’s forgiveness, reconciliation and being the peacemaker. Upper Church, Feast Day of St. Rita. Photo credit: Father Dan McLaughlin, OSA, St. Rita’s Shrine. The Mass includes the general intercessions or prayer of the faithful. Although most intercessions are beautifully scripted some can be spontaneous petitions or intentions, especially at daily mass. During Mass, in the Creed, we Catholics profess the belief in “the communion of saints” or the relationship we have with the saints. We ask in prayer to those believers in this life and beyond. Specifically for the Mass on the Feast of St. Rita, the Celebrant says: By their way of life you offer us an example, by communion with them you give us companionship, by their intercession, sure support, so that encouraged by so great a cloud of witnesses, we may run as victors in the race before us. 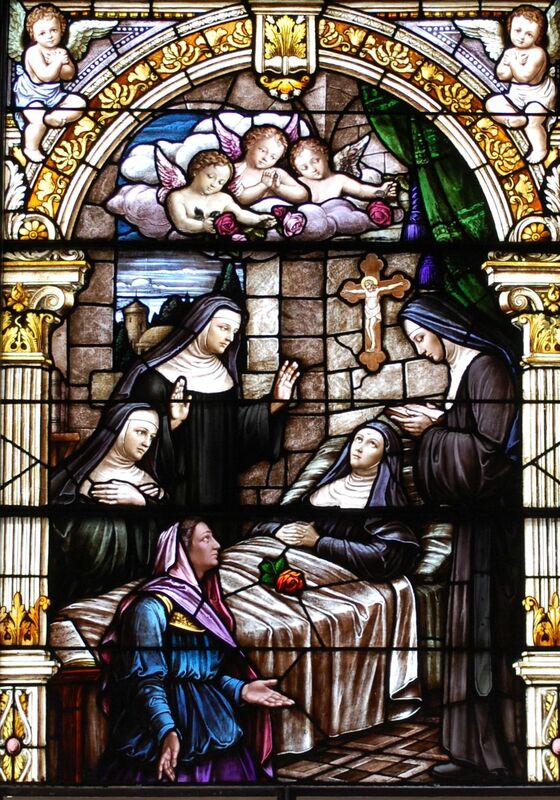 St. Rita an influencer, given special grace in heaven. Another form of intercession is from recognizing the saints life. Fr. Michael, in the St. Rita Shrine Peacemaker newsletter says, “The great popularity of Saint Rita is due as much to the power of her prayerful intercessions as the the force of her testimony.” Her life story is surely a testament to her holiness. 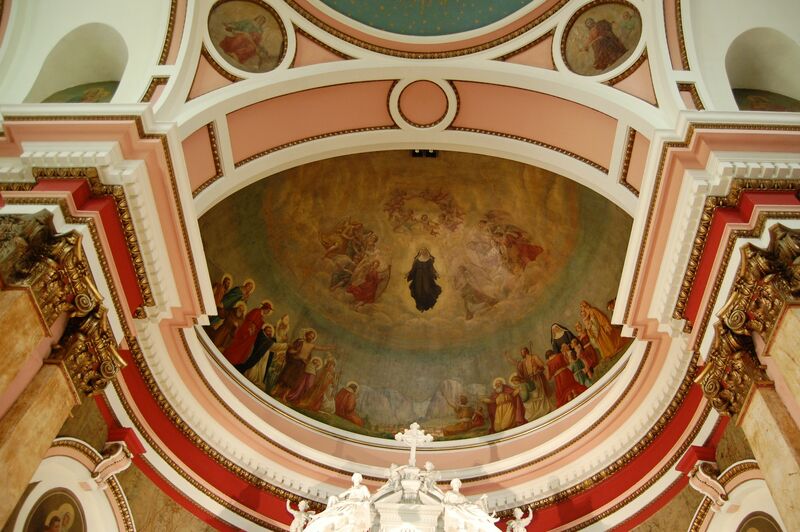 Looking up above the altar, St. Rita is received into heaven with joy. The Solemn Novena of St. Rita is a powerful method of intercession. The Solemn Novena of St. Rita is prayer and Mass over a nine day period prior to her feast day, to obtain graces from God through her appeal. The Litany of St. Rita are the prayers said after Mass as a subset of the Solemn Novena of St. Rita. There are many different aspects of her witness and appeal in these prayers. With the marks of Your love and Passion. 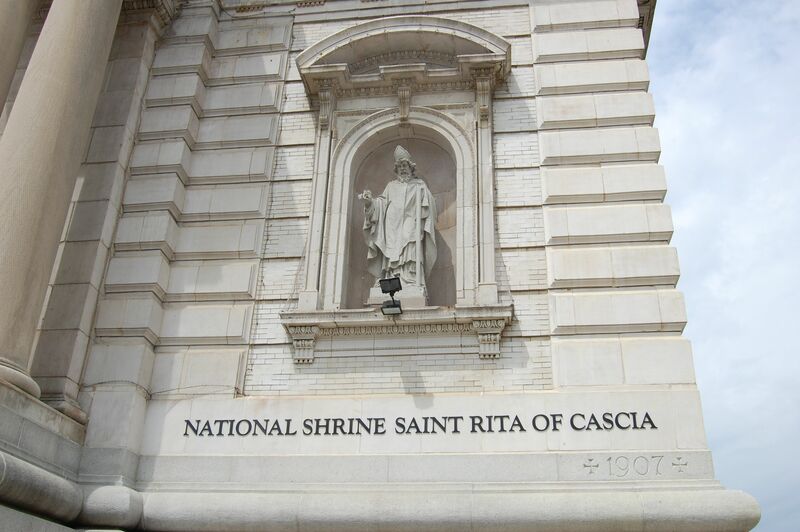 More information on The National Shrine of St. Rita of Cascia is here.